Before the mid 1970’s boats were typically lifted with a pair of davits. These crane like structures are mounted to a piling or set in the ground above a sea wall, utilize a fore and an aft cable which are connected to lifting eyes on the watercraft. Boaters find davits difficult to use, as the distance between connecting points on the boat make them challenging for one person to operate. 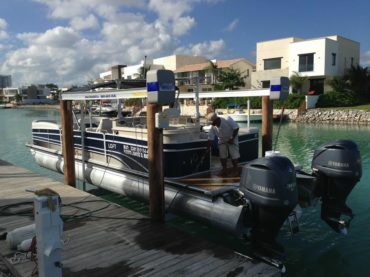 While davits are used today for lifting smaller watercraft in some unique situations, their position as the industry standard has been largely replaced by lifts that support the boat on bunk boards connected to a lifting platform or cradle system. 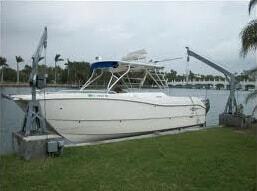 A major breakthrough in boat lift design occurred in the 1980’s. Aluminum was introduced as a structural material to replace galvanized steel. Although slightly more expensive than steel, its long-term appearance and corrosion resistance make it a superior alternative. Today, the best boat lifts are made from aluminum. It has steadily supplanted galvanized steel, as consumers have become knowledgeable enough to recognize its’ superiority. 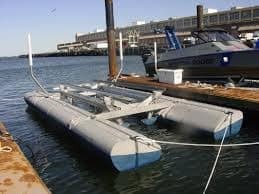 Over the last 30 years, a number of methods to lift a boat with a cradle system have been developed for marine lift applications. Hydraulic cylinders, pneumatic flotation, and wound cables have been explored in various configurations. 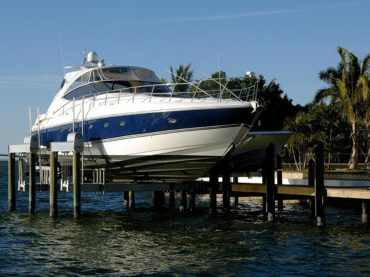 Hydraulic boat lifts have been found to be difficult to protect from saltwater corrosion, susceptible to oil leakage, and they also are relatively expensive. Piling or sea wall mounted cable-drawn boat lifts have become the choice in coastal waters. They lift the boat free of the water in minimal space at an affordable price. Of course, a number of ingenious cable routing and structural techniques have been developed by Imm Quality engineers. Intelligently designed, rigorously tested at our in-house test facility, field tested by over 25,000 lifts over 30 years in business and continuously refined by our IQ engineers based on feedback from our customers, Imm Quality Boat Lifts now offers the following models: vertical boat lifts, elevator boat lifts, boat house lifts, personal water craft lifts, yacht lifts and specialty boat lifts. At the present time the most popular design for a cable drawn boat lift is the horizontal beam design. It was developed over 30 years ago, and it has become the industry standard. It can be recognized by its two parallel beams, between which the boat is located prior to lifting. These beams each contain a motor driven shaft through their length on which 4 cables are wound. Cables are connected to the four corners of the boat cradle, which is raised or lowered by clockwise or counter clockwise rotation of the shaft. 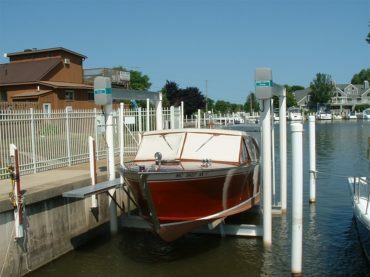 Shafted beam boat lifts are typically mounted on four pilings, although very large lifts of this design have four motors and four shafted beams, and are supported by eight pilings. IMM Quality Boat Lifts manufactures four lines of beamed lifts: the Alumavator, the Platinum, the Superlift and the Titan yacht lift. A chain drive with the drive sprocket solidly welded to the shaft. No shear prone bolts are employed in this connection. Furthermore, the mechanical forgiveness of a chain connection to the drive shaft has an inherent flexibility, thus minimizing stress as the total lift system moves and strains under heavy loads. Chains insure a positive direct drive from the motor to the shaft. Boat lifts are considered heavy equipment. Chains are the drive of choice for marine heavy equipment along with logging and earth moving equipment. Chains are less apt to break than a gear is to shear teeth and our continuous loop chains have never failed when properly lubricated. The platinum drive was engineered specifically for marine boat lift duty and provides a maintenance free, double worm direct drive transmission to shaft connection. Custom extruded top beam channel, white vinyl covered aluminum bunks and maintenance free drive bearings. No other residential duty boat lift can match the features and performance of our Platinum lift. Its highly efficient, industrial duty cycloidal gearless reducers, the finest reducers made, produce more torque and result in the fastest lift speeds on the market. No inefficient worm gearing is employed in the drive system. Cable is wound on large winders to provide a greater drum to cable diameter ratio to insure long cable life. We do not use aircraft control cable, which is woven with fewer but larger strands of steel to minimize stretch. Instead, we use limp fine wire cable like that used in public elevators and ski lifts to minimize work hardening and further insure long cable life. These and other unique features provide peace of mind. Moreover, efficiency translates to lift speed. Our SUPERLIFT will elevate a yacht at speeds many times faster than conventional lifts, minimizing the time necessary for the captain to hold the boat in lift position. During the 1980’s, the need for a new type of boat lift was recognized. The elevator style was engineered to work on waterfronts where outboard pilings were not allowed, or where bottom conditions made the driving of pilings difficult. 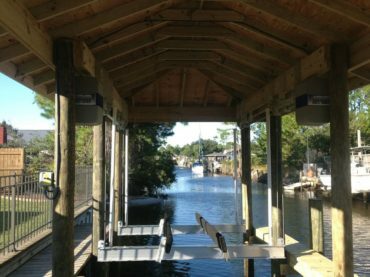 Elevator Boat Lifts utilize a cable drawn platform with wheels that ride on an angled or vertical beam. This beam rests on the bottom and supports the lift, thereby eliminating the need for pilings. Elevators do require sacrificial zinc anodes to prevent corrosion. These anodes, which are periodically replaced, prevent the partially submerged vertical metallic beams from decomposition in seawater. Our ELEVATOR Boat Lifts are available with the Alumavator, Platinum and Superlift drive systems. 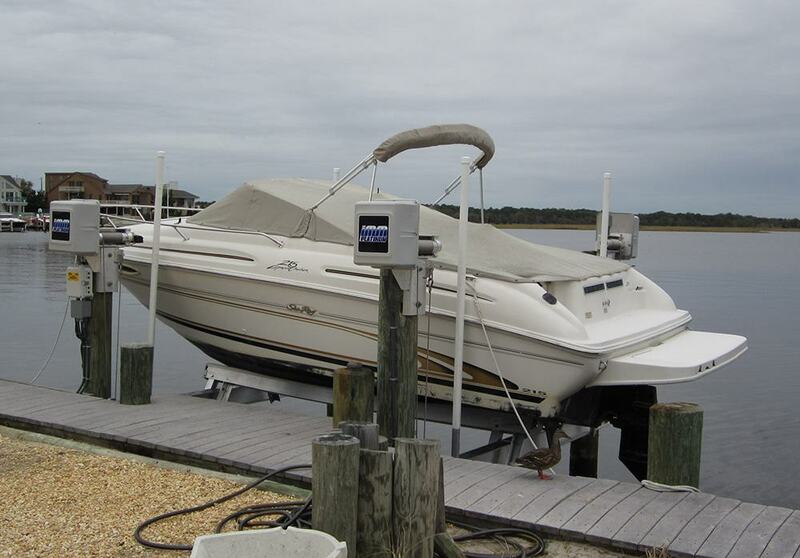 Popular in the mid-Atlantic region, beamless boat lifts have steadily increased their market share. They have a cable-hung platform supported at each piling. As their name suggest, these boat lifts do not have winders supported by an upper beam. Rather the winders are supported by a piling and the cables run through the lifting beams to the opposing piling. Their increase in market acceptance stems from the unobstructed access a consumer has to his boat. Beamless lifts are typically supported by four pilings, although our IQ engineers have developed a lower priced, space saving three piling model. 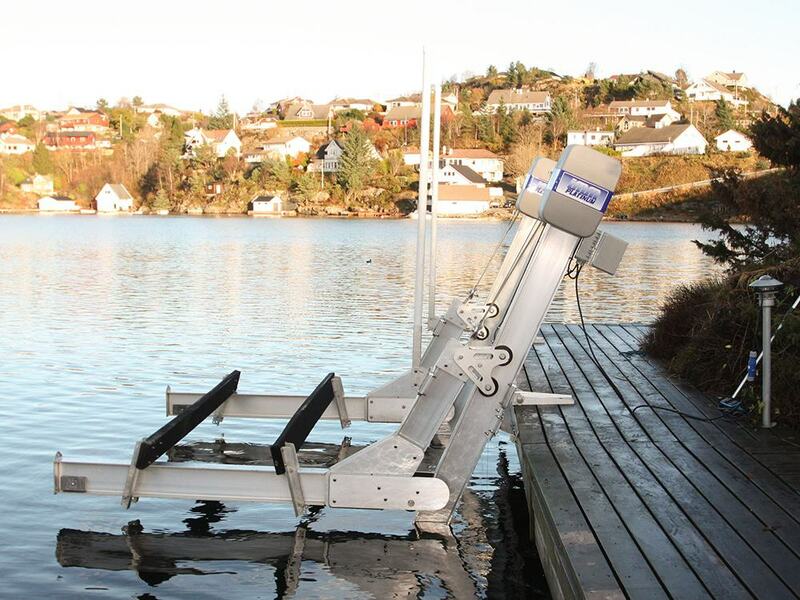 Our BEAMLESS boat lifts are available in the Alumavator and Platinum configurations. Due to the different ways in which boat houses are built, we have developed several styles of boat house lifts. Lift hanger bearings are the most common and effective way to mount a lift inside a new or existing boat house. The hanger assembly slides over the stringer bands of the boat house and are fastened in place using stainless steel bolts that require no drilling of the bands. Stringer brackets are a roof riser which is mounted directly on top of a beamed boat lift and connects the outer support bands to the lift. These brackets are used to support the roofing system. Suspension brackets allow you to hang a standard horizontal beam lift in various positions along overhead support beams and allows full adjustability in all directions. Our boat house lifts are available in the ALUMAVATOR and PLATINUM configurations. We re-engineered our elevator lift design to accommodate your personal water craft. The 1,500 lb. capacity lift has a 180° swivel mount. 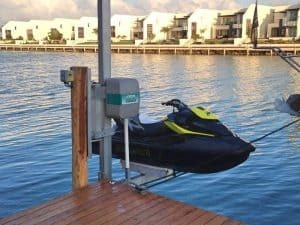 Our PWC lifts can be made to accommodate up to two jet skis or made as a lifting platform. Utilizes the enclosed power head chain drive and all aluminum structure. Variable speed programmable logic controllers with soft start and stop, self-leveling and multiple stop point settings. Available with smart phone integration, an industry first. Our TITAN will elevate a yacht at speeds many times faster than conventional lifts minimizing your wait time, because after all, time is money. Like many technologies, watercraft lifts have taken a technological leap since Imm Quality Boat Lifts, entered the market place and continue to improve today. Only customer driven, technology based organizations like Imm Quality Boat Lifts are prepared to lead this industry into the next millennium. 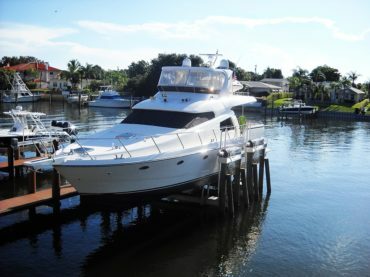 When you are looking for a watercraft lift, and only the best will do, choose Imm Quality Boat Lifts. Built for a lifetime. IMM Quality Boat Lifts is the world’s leading manufacturer of aluminum boat lifts, including personal watercraft (PWC), elevator, boathouse, Alumavator, Platinum, Superlift and Titan yacht boat lifts models. Located in Southwest Florida, we design and develop our own boat lifts in-house at our manufacturing facility and ship world-wide. Let our 30+ years of boat lifting experience help you design the perfect lift for your boat, complete with an industry-leading warranty. Contact us or use our dealer locator today.